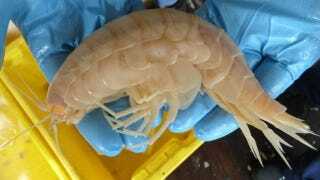 This supergiant amphipod has just been discovered in a deep sea trench near New Zealand. Its shallower cousins are one-tenth its size. The University of Aberdeen and the National Institute of Water and Atmospheric Research recently submerged cage traps rigged with cameras off the coast of New Zealand. The cameras were enclosed in glass to protect them from the pressure at the bottom of the Kermadec Trench, which hits depths of 33,000 feet. The researchers couldn't believe their screens when one trap hauled up a gigantic, 34-centimeter-long amphipod. 34 centimeters might not seem like "supergiant" status, but know that the typical amphipod is three centimeters long. Remember in King Kong, when they went to Skull Island and were suddenly besieged by giant insects? Project researcher Alan Jamieson compared these creatures to foot-long cockroaches. Like Atlantis, Skull Island has apparently sunk to the bottom of the sea. And there are bound to be a lot of these supergiants down there. Amphipods thrive in high pressure environments, moving in swarms. For the most part, they're scavengers. These supergiants probably comb the sea floor looking for dead animals that have sunk. And if the amphipods get this big, what other oversized fauna is lurking down there?